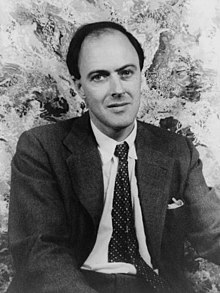 Roald Dahl (born 13t September 1916 – deid 23t November 1990) wis a Welsh writer, famous for his novelles, short stories an parteecular for his beuks for bairns. Mony o his beuks an stories hae been made intae films an shawed on TV aw athort the warld. Amang his maist faur ben beuks are The Sleekit Mr Tod, The Eejits an Geordie's Mingin Medicine that hae been owerset intae the Scots. Mony o his bairn's beuks hae picturs drawn by Quentin Blake. Thare is a Roald Dahl Museum an Story Centre in Great Missenden that shaws the wark o Roald Dahl. Wikimedia Commons haes media relatit tae Roald Dahl. This page wis last eeditit on 19 Februar 2018, at 18:21.